“ It was in 1997-98, I started a personal jamming room at my residence for my band. It slowly emerged to be popular as other bands visited and practiced. In 2007, the jamming room was made open to public under the banner Beats Farm. A Drum set and Ampli-Speakers are provided at the jam room and the musicians bring their own Guitars, Microphones and other gadgets. Currently we have Pre-paid electricity connectivity and backup generator is used if required. The room is 70/80 percent sound proofed. During rush hour the jam room is open from even 7 am in the morning. Usually we have the first come first serve system here but bookings are done in case a band is practicing for more than one day. The visiting bands sometimes practice up to 9 pm or 10 pm. During day time, mostly the metal bands practice and Blues or Softer Genre bands are suitable in night schedules as they make lesser sound. Locality and neighbors complain sometimes but we negotiate”, says Bulo owner of the Jam Room. Bulo was a singer with the band ‘Kradle of Beats’. Senior bands like Phynyx, Phoenix, Post Mark, Fringes, Pulse Pandit, etc have visited the Jam Room for their practice. Junior bands including almost all metal bands make their entry at the Jam Room very often. Chem Weed FM, The Wishess, 3 Strings, Lucifer X, Dead Mobster, etc are some of the bands. Gospel Bands like Lun and party and some bands from Churachandpur, New Checkon have also visited the jam room for their practice. 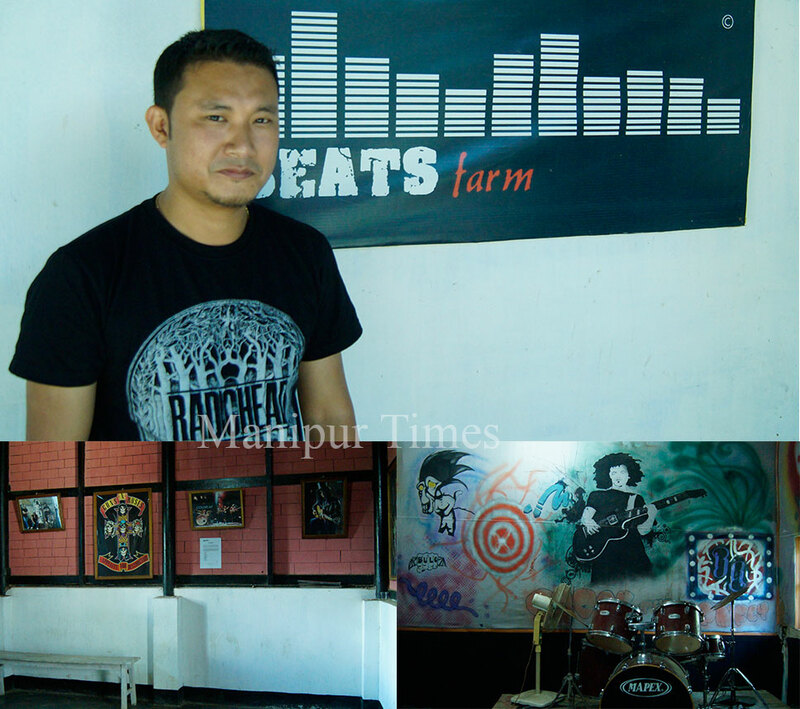 Almost all the bands in Manipur have visited Beats Farm and a thick register is being maintained with date and time. Beats Farm is located at Palace Compound. Musical bands have less rehearsal place in Manipur. Shortage of electricity is one major factor why many bands turn up at Beats Farm. Generator is costly and moreover carrying the Drum set or Speakers from one location to another for rehearsal is cumbersome to the bands. Bands find it quite comfortable at Beats farm which has regular supply of electricity since long time back and a drum set and other basic infrastructure installed for practice. Highest turn up records 20 bands on a single day. 30 mins slot is given to each band on such rush. New slots are given on the next day for those who miss on the day. Beats Farm does not allow intoxicants in its area. Bands can make noise in the jam room but outside of it, bands maintain silence. Some wait in the waiting room. Sound proofing and re sound proofing of the studio was done thrice. No advertisement was made officially for Beats Farm and people came to know all by themselves. Up gradation plan in either expanding the room or making another studio for more capacity is often thought of by the owner. Beats farm operates on a first come first serve basis. However booking system is also there. They maintain a register and a sum of Rs. 120 per hour is charged as a fee. The rate was Rs. 50 when Beats Farm started back in 2007. The money is used for the maintenance of the Jam Room. During concert season many bands line up. Sometimes no bands turn up during off season and it remains silent. 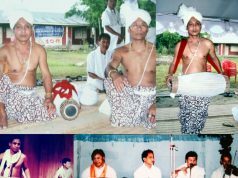 October to March is the time where many concert takes place in Manipur. There are also concerts during rainy season too these days. Jam room is practiced in many States. 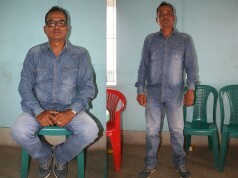 In Imphal few jam room have open up recently. Most of the bands come here when they have to perform in a concert. Sometimes they just come to practice. A band called Argos visits Beats Farm in a unique way as they are dropped by their parents and are picked up when they are finished expressed Bulo. 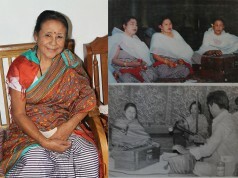 Popular Hindustani orchestra members including Purnananda was also one of the visitor of the Jam Room. Uttam and his band was also a frequent visitor earlier. Bulo works as an IT Officer for the Government of Manipur as of now. When he goes to office, his sister maintains the jam room and even his Grandmother helps in the registry and time keeping for the shifts. Bulo also give tuition to children in learning how to play drums or guitar at his center on Sundays. He teaches mostly the basics of the instruments. Bulo started playing music since his Seventh standard and now he is 34. His band ‘Kradle of Beats’ had also released a music video album ‘Waiting’ in early time. All five brothers are musicians. One of his brother is in a band called Renegades. Another two in the same band with Bulo. One of his brother Robby is a classical guitarist and an instructor and all of them stay outside Manipur. His two uncles were guitarists and drummers. 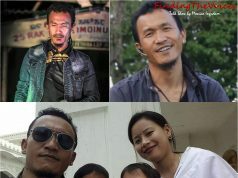 One of his uncle was the guitarist of the band ‘Runaway tracks’ which is one of pioneering rock band of Manipur. Since 1970’s from the time of his uncles, his residence has been a center for Jamming. Starting an event management group. In 2007, Bulo and his friends started an event management group call River Boat which has organized many musical concerts yearly. “Metronome” was a popular concert organized by River Boat on a yearly basis and other concerts included A Minor, B Minor, C Minor, etc. The concerts were mostly ‘Theme based concerts. For instance, B Minor concert was under the theme ‘The Strength of a Woman’, and the artists who performed included most of the popular women singers. “A Minor – Bringing Back Yesteryears” concert was another concert where old country classic rock singers and numbers were performed. The last concert River Boat managed was ‘Phynyx Reunion’ with the concert banner ‘Phynyx Risin’. Shillong based band Soulmate also performed in that concert. Around 2006, Rock concert was not frequently organized like today and River Boat started out and built up a frequency to break the silence. The core idea of forming event management team was to separate the artists and the management section. The artists do their rehearsals and the other team comes up with event management activities. Thus, River Boat in-house band and River Boat event management team were formed. Besides that, providing a platform to our local bands to expose themselves and at the same time entertainment for the youths which is a very necessary thing had led to the formation of River Boat. 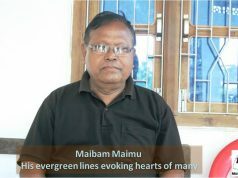 We at River Boat believed entertainment through musical concerts was one way to give some good time to our youths in a troubled torn State like Manipur and at the same time a place where our local artists and bands can showcase their talents or launch their careers in music says Bulo. River Boat management section takes care of the ticket selling, poster making, going for permits, etc . The artists are left to practice for their best performances because an artist if involved in all these activities will eventually have lesser performance energy. Phynyx is one of my favourite band amongst the local bands. Their vocalist, Tamo Len Gangte has amazing vocals. During 1990’s they were one of the best band of India and I want them to continue so that they could be an inspiration to us and the younger generation says Bulo. ‘Think Flyod at Thau ground. Parikrama Concert & Firehouse concert. 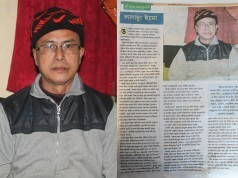 Challenges and Strategy of Manipur. We need to have determination and struggle. We need to continue longer like the bands in Shillong or Mizoram which are more consistent. Though the western music scenario may be different here in Manipur compared to our neighbouring States like Meghalaya, Mizoram, we need to face the struggle and overcome the challenges. Rudy Wallang of Soulmate, Lou Majaw has been performing since I was in school days says Bulo and they are still performing which is really motivating and inspiring. Success is not achieved in short period of time so we need to keep doing what we are doing opined Bulo. 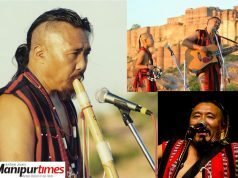 Some of the major challenges we musicians face in our State is that it is difficult to make a living out of music in Manipur. It is also one reason why many bands have discontinued or discontinue. But I would say that it’s no more like the old days and that things have changed and bands, if willing and determined can achieve the same like the other successful bands in the country. As far as challenges with respect to concert organizing is concerned, we have renowned International bands frequently visiting the other North Eastern cities but there has been only one band i.e. Firehouse which has visited Imphal till date. I suppose one challenge in hosting such events with International bands is cost for the events which are huge. Unfortunately, we also do not have corporate houses in Manipur, there is less sponsors or no sponsors which make it impossible to bear the cost of such events. So, we need stakeholders for investments to bring up music in Manipur says Bulo. We have the crowd here in Imphal and the crowd turnout in Firehouse concert was also massive. The most difficult task in hosting a concert from my experience is crowd management. We need to have good crowd management skills for a large crowd because any loopholes in crowd management can be disastrous. 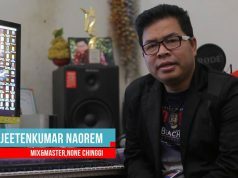 Parents here generally wants different genre of music while their children wants different genre of music in Manipur. I believe guidance and support by parents/guardians can help the bands in achievement of many feats. Bands should have more exposure by performing or participating in events held outside the State. There are people who have achieved despite of all odds. We should appreciate the struggle and support these artists, individuals, bands who have achieved such feats. And lastly but not the least, I believe in “Music without Drugs”. 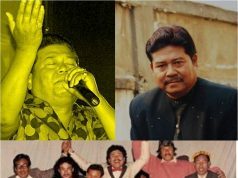 The talent we are gifted with is precious and we should not squander it away by associating ourselves with drugs says Bulo who has been associated with various bands of Manipur over a decade and more.